I waited my five days in three different places, with three totally different kinds of people, who were all so kind. The last two nights I stayed at Evelyn’s, a member of couchsurfing and a German who teaches Russian in Norwegian (!). So I enjoyed a conversation about linguistics, history, politics, which nourished my mind and prepared my for the huge country I will be going to. Evelyn told me a lot about Russia and the Ukraine, for example about the historical towns of the Golden Ring around Moscow, of which I was ignorant, and about the 3th class in trains called “platzkart” where traveling is not only cheaper, but also funnier since you meet many talkative Russians. I will go and see for myself. Without problems I got my visa (someone at the consulate told me, I should have brought a confirmation of my payment, but it was already lying on his desk, right in front of him. Puh-ha! So the topic of the “dokument” and “your papers are not in order” was safely overcome), and I took the minibus to Murmansk. We arrived at the border when it was already dark and had to go to several cumbersome checkpoints, just like in airports. Our bags were driven through a machine that bleeped, but the officers didn’t care. We got back in the minibus and drove another three hours to Murmansk. Thank you so much! Alyona and two friends showed me around Murmansk during a nighttime stroll, and I got a glimpse of the atmosphere of this rather large arctic town. Murmansk is a relatively young city (in fact, the last Russian city to be founded, in 1916). 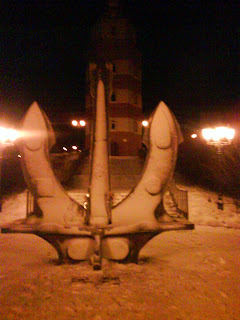 A lot of sailors live here (Alyona’s father was at sea). They showed me a huge statue with an eternal flame in front of it. It was a concrete soldier standing 35 meter tall, watching out over the bay of Murmansk, and the monument for the marines who died in the submarine accident with the Kursk in 2000. It was cold and windy, and we decided to walk back home. A very good night. August 7. A Neva ending boatride. February 19. A nice couple.